(Bloomberg) -- A new spat between European Union members erupted when the president of the bloc’s parliament, Antonio Tajani, referred to parts of Croatia and Slovenia as Italian on a day commemorating the slaughter of thousands of his countrymen following World War II. “Long live Trieste. 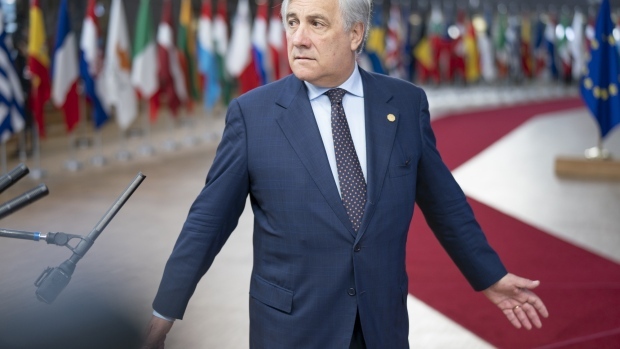 Long live Italian Istria, long live Italian Dalmatia, long live the Italian exiles and long live the heirs of the Italian exiles,” Tajani said on Sunday. His comments in Basovizza, Italy referred to the thousands of Italians who died and hundreds of thousands more who fled the Adriatic Sea border regions during the foibe massacres of 1943 to 1945 to escape Yugoslav partisans after World War II. The regions subsequently became part of Yugoslavia and, later, Croatia and Slovenia. Croatian member of European Parliament Ivana Maletic denounced Tajani’s comments as "completely unacceptable" and said that the spat may turn voters in the Balkan state away from polling booths in the elections for the chamber slated for May. "My position is that he can’t remain the president of the European Parliament," Maletic said of Tajani. She was joined by Slovenian Foreign Minister Miro Cerar, who tweeted: "any distortion of historical facts about the events in the border area between Slovenia and Italy is unacceptable." Both said they would seek an explanation from Tajani.